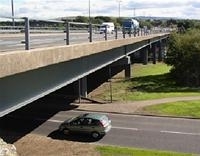 The council is responsible for 742 bridges located throughout West Lothian. Of these, some 578 bridges are managed and maintained by the council. The remainder are managed and maintained by bodies such as Transport Scotland, Network Rail, Scottish Canals and Sustrans. The Structures team manage and maintain highway structures within West Lothian, so as to provide structures that are safe to use, fit for purpose and meet agreed performance targets. West Lothian Council currently carries out visual inspections (general inspections) of structures every 2 years and more detailed inspections (principal inspections) every 6 years. Results of these inspections are used to establish, cost and prioritise future maintenance programmes. The bridge stock is managed using the Confirm Structures Database, which holds details of all council bridges. Inspection Reports are also held in this database together with details of the Condition Indicator for each bridge. Maintenance work undertaken by the Structures Team is normally identified through the General and Principal Inspection Programme. However, reports from members of the public are also valuable in identifying necessary bridge work. Defects to structures are rated according to their extent and severity. Accidental damage is mainly caused by vehicular impact. This often results in damage to bridge parapets or, in the case of over height vehicles, damage to the bridge deck. The Bridges - Road Network Restrictions indicator is reported on an annual basis via Audit Scotland. There are currently 26 listed bridges in West Lothian. The Council works closely with Historic Scotland in managing and maintaining these structures. You can report damage to any structure in West Lothian by contacting the Council's 24 hour Customer Services Centre on 01506 280000. A brief description of the damage and location of the structure is very useful in helping us identify the relevant structure. specialist advice on building structures and civil engineering works. The bridge stock comprises masonry, concrete, steel, timber and composite structures. The council is also a member of the Society of Chief Officers of Transport in Scotland (SCOTS) Bridges Group.